pLog is the most advanced application for collecting site investigation and environmental sampling data in the field. pLog is the industry leader in geotechnical and geo-environmental data collection technology. It is the most advanced application for collecting site investigation and environmental sampling data in the field. pLog Tablet allows users a new range of hardware options for field data collection, furthering the digital data collection model that Dataforensics has been a proponent of from the inception of the company 10 years ago. The tablet version of pLog greatly enhances usability by allowing users to leverage new hardware options with bigger screen sizes, faster processors, greater storage capacity and real time data sharing. (*Availability of cellular network as well as WIFI connections will determine real time capabilities). Graphical Log Preview – The ability to view a standardized borehole log in graphical format as data is entered has been a common request from our users. 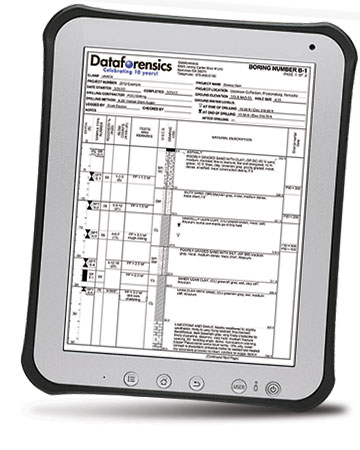 That dream is now a reality as you will be able to view the log graphically on the tablet so you can better visualize the investigation as it is happening. Real-time data sharing – The ability to send the data and/or the standardized log report electronically directly from the field makes sharing data with your colleagues a simple process enabling better communication between field and office staff. A simple and direct data export to any log reporting system via Dataforensics pLog Integration Component (pLogIC) – The new pLogIC (pLog Integration Component) provides the ability to integrate your data recorded in pLog Tabletwith nearly any software application. pLogIC provides the ability to export the data, format it including (ordering, and formatting of soil and rock descriptions) in any format you need. pLogIC exports data in CSV format (for any data structure) as well as the LogPlot .DAT format. Users no longer need to install anything on their PCs to retrieve their data. pLog directly exports field data to any log reporting including gINT, LogPlot, HoleBase, ESdat – eliminating confusion for the user and simplifying installation while reducing the IT resources necessary to run the system. Dataforensics has currently performed integrations with gINT, LogPlot and HoleBase SI for borehole logs and ESdat for environmental data. If your firm requires an integration not listed here, please contact [email protected] for further information. Streamlined navigation – No more tapping between screens to input a specific type of data – all data can be accessed for a particular module from one screen. What are the system requirements for pLog? The PLog software is developed for 7" and 10" Android tablets, version 4 or later. Is maintenance provided for the pLog software? License includes a 2-hour online training session, and 1 year of free maintenance and phone/email support.